Batch 26 commences May 25,2019. S P Jain Institute of Management and Research (SPJIMR) is a leading school of management in the heart of India’s financial centre, Mumbai. 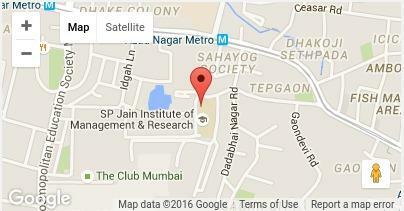 SPJIMR is a part of the Bharatiya Vidya Bhavan and functions as an autonomous institute with entrepreneurial agility. It consistently ranks amongst the top ten management institutes in India. Inaugurated in 1981 by the then British Prime Minister, the Late Hon. Margaret Thatcher, SPJIMR’s mission is to Influence Practice and Promote Value-based Growth. It builds on this mission through pedagogic innovations and pioneering programmes, carving a distinctive path in management education. SPJIMR has acquired the reputation of meeting societal needs of under-managed sectors by offering unique, purposeful and relevant initiatives. More than 1,000 participants from diverse backgrounds are enrolled at any given time across a range of management programmes offered by SPJIMR. SPJIMR has been awarded accreditation by the prestigious AACSB International -The Association to Advance Collegiate Schools of Business. PGDM, PGPM and FPM are approved by the All India Council for Technical Education (AICTE). 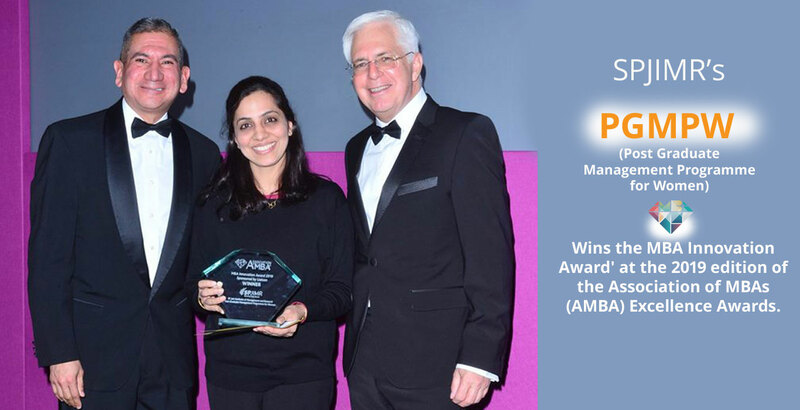 PGDM, PGPM, PGEMP and PGPFMB are accredited by the Association of MBAs (AMBA), UK. 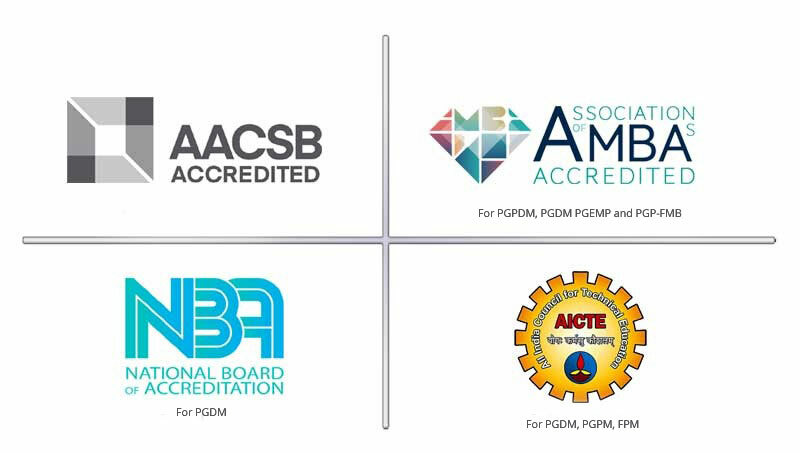 The PGDM programme is also accredited by the National Board of Accreditation (NBA). SPJIMR offers a broad spectrum of programmes and courses for postgraduates, executives, entrepreneurs, non-profits, government returning women and family businesses. SPJIMR’s two year Post Graduate Diploma in Management (PGDM), attracts some of the brightest young minds in India. It offers four specialisations- Finance, Information Management, Marketing and Operations and Supply Chain. The Post Graduate Programme in Management (PGPM) is a 15-month programme aimed at working professionals with a minimum experience of five years and seeking an accelerated growth in their careers. The Global Management Programme (GMP) offers a global curriculum and a diverse learning experience, the Post Graduate Management Programme for Women (PGMPW) is designed exclusively for women seeking to return to the professional arena post a break, and the Fellow Programme in Management (FPM) a full time doctoral programme. SPJIMR also runs a successful Post Graduate Family Managed Business (PGFMB) programme, the Post Graduate Executive Management Programme (PGEMP) and the Post Graduate Programme in Development Management (PGP-DM). SPJIMR’s Delhi Centre offers the Post Graduate Programme in General Management (PGP-GM) designed for experienced professionals who are unable to take a career break for further education. To equip its participants with a diverse understanding of business and management across national and cultural boundaries, SPJIMR has collaborated with some of the best business schools and universities from around the world. Its GMP collaborates with reputed and FT-ranked Business Schools in the US: Brandeis University; Robert H. Smith School of Business; Stevens Institute of Technology and in Europe: EBS Universitat; IESEG School of Management; Nyenrode Business Universteit. The PGDM participants gain a holistic perspective in their area of specialisation at globally top-ranked B-Schools through the Global Fast Track (GFT). The GFT is an intense, three-week course towards the end of the third semester. The *partner B-schools include (but are not restricted to): Michigan State University (Eli Broad College of Business), Cornell University (Johnson School of Management), Carnegie Mellon University (Tepper School of Business) and schools in Europe and Asia. The PGPM students spend 3 weeks for advanced specialisation courses at top global b-schools through their International Immersions at: SC Johnson College of Business, Cornell University; McCombs School of Business, University of Texas at Austin, SC Johnson College of Business, Cornell University and Broad College of Business, Michigan State University. There is also an opportunity for students from PGDM to pursue specialised courses in leading foreign B-schools for a full semester as exchange students. A student pursuing his/her master’s programme at the home university is eligible for participating in the Exchange Programme. The exchange student is eligible to enroll in a minimum of one and more than one cluster and semester. *The list of schools may change every year. The late Dr. M L Shrikant built, nurtured and led SPJIMR for 28 years, seeing it rise under his watch from an insignificant and little known place, literally and figuratively, into a giant of an institution that sits among the top 10 schools of management in India. As Hon. Dean, Dr. Shrikant worked without a salary and tirelessly crafted new courses and programmes, created innovative pedagogies and focused relentlessly on values and contribution, driving a revolution in the field of management education and setting SPJIMR on an unprecedented growth trajectory. He positioned SPJIMR as an institution with a difference, noted for a good mix of Western efficiency and Eastern ethos within an ecosystem that encouraged performance with purpose. Apart from other initiatives, Dr. Shrikant conceived, nurtured, built and delivered the course ‘Science of Spirituality’, combining his unique blend of education and experience of leading business organisations along with his study of the Vendanta for the last three decades. Dr. Ranjan Banerjee, who took charge as SPJIMR Dean in June 2015, has said that SPJIMR under his leadership would build on the vision of Dr. Shrikant to take the Institute to new heights. Dr. Manesh L Shrikant led SPJIMR for almost three decades. He stepped down in Nov. 2014. Dr. Shrikant passed away on October 16, 2015. "We teach that material success is important but it can ring hollow without an understanding of the deeper purpose that must guide our decisions and a spirit of service that must lead us to action." SPJIMR is a constituent unit of the Bharatiya Vidya Bhavan, India’s premier non-profit that has for over seven decades worked in the cause of education and for preserving and promoting India’s rich cultural heritage. The Bhavan was founded in 1938 by Kulapati Dr. K.M. Munshi with the blessings of Mahatma Gandhi and the active support of several eminent leaders like Sardar Patel, Dr. Rajendra Prasad, Pt. Jawaharlal Nehru, Shri C. Rajagopalachari, Dr. S. Radhakrishnan and many other scholars and eminent professionals. The Bhavan is registered under the Societies Registration Act XXI of 1860 and the Bombay Public Trust Act of 1950. The Bhavan believes that revitalising ancient values and reintegrating them to suit the changing needs of modern times alone will give people the strength to assimilate whatever is good in the new, without being swept away from their traditional moorings. The main purpose of the Bharatiya Vidya Bhavan is to provide a modern bridge to span the past, the present and the future, built on the strong foundation of the fundamental values of life. The essence of SPJIMR, a journey of courage and heart that has taken us from a little known B-school to a leading school of management today. We are now a top ranked institute noted as much for academic excellence as we are for our innovative programmes, an entrepreneurial approach and the idea of service to society. Watch our journey, captured here in an eight-minute film which is being released as part of the celebrations to mark the 36th SPJIMR Day on April 17, 2017.